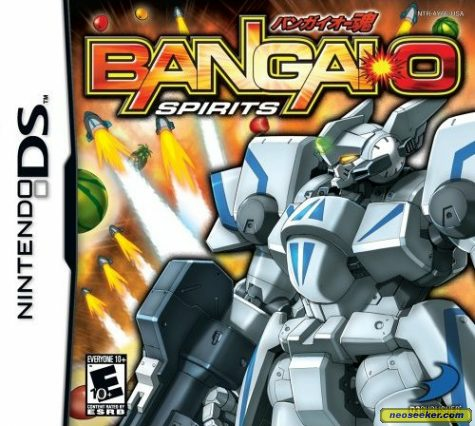 Bangai-O Spirits is a NDS game which is the sequel to Bangai-O. It is a 2D side scrolling shooter that can get quite chaotic in some stages. The player takes control of the Mech, Bangai-O, which before initializing a stage, the player can choose from a variety of different weapons each with their own unique ability, such as Homing, Bounce, Napalm, Break, and a few others. This game also features the EX weapon, which allows the player to release either a barrage of the chosen weapon or use a special type of Ex, such as Freeze and Reflect. Depending on the situation (how much the player has charged the EX, and how many shots are being fired at them), the player can release from 34 normal shots, to 100 shots 4 times their size and power. Another move Bangai-O can perform is boost, making the player travel faster and damaging enemies in the way. A catastrophic wave can be made by using boost, a bat or the EX move reflect to knock an enemy into another, forming a chain reaction of enemies flying about the stage. In fact, the shots, explosions and destruction in general in-game actually slows everthing down and some things won't e. The game only contains 3 characters other than Bangai-O, being a Professor, a boy and a girl. These characters are only involved during the tutorial levels, explaining different aspects of the game and controls. Other than the tutorial, Bangai-O Spirits has basically no storyline or plot. However, it has a free play mode where the player can challenge themselves with over 150 stages, not including custom-made stages. These free play stages range from Treasures Best, maps made by Treasure, Puzzle Stages, Other Stages and Custom Stages. One interesting part of Bangai-O Spirits that really stands out is Edit Mode. The player can simply sculpt a level by the use of the stylus and utilising tools from the window. BG allowing the player to create the basis of the level, Objects being enemies, breakables and others, and edit, which is replaced by Play if using the edit window during a level by pressing select. Up to 24 custom levels can be created from scratch or from building off another level. In conlusion, I find that Bangai-O Spirits is a very fun and amazing game to play.